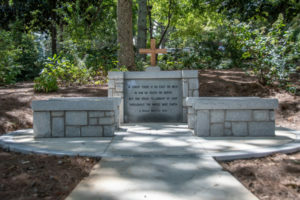 A place to stop along the way, to reflect and pray – that is the purpose of the Reynolds Wayside Chapel nestled just off the walking path in the center of campus. Gifted to the University in honor of his family, Garland Reynolds, longtime University architect, put great thought into the design. The picturesque outdoor chapel captures the essence of John Wesley, founder of Methodism, and mirrors Reynolds Square in Savannah. Reynolds Square was designed in 1773 by Gen. James Oglethorpe and later named for John Reynolds, the first Royal Governor of Georgia. It is where John Wesley’s home was believed to have been before he returned to England. The cross, which sits atop a stone monument bearing a well-known hymn, is constructed of olive wood imported from Italy. The cross itself was constructed by a company owned by famous country music singer Zac Brown. Reynolds wanted the cross to be something special to Reinhardt, so he worked with Brown’s company to ensure something iconically Reinhardt was included. “I asked, ‘Can you do something to put the Reinhardt logo on ends and tops of this cross,’” Reynolds recalled. Those who look closely will see the recognizable “double Rs” from the Reinhardt University logo. As students need quiet time for prayer, reflection or meditation, they now have an outdoor space to turn to – to realign their thoughts, purpose and faith.